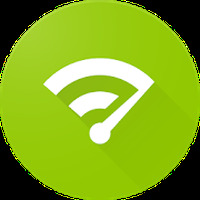 "Analyze & boost your internet access in seconds"
App description: With Network Master, the user can identify and safely connect to Wi-Fi networks. Functions: In addition to checking the list of available wireless networks, the user can measure the speed of the connection, check which applications consume the most data, evaluate security levels, detect intruders and solve network problems. Controls: Attractive and well-organized touchscreen interface. Compatible only with the latest Android versions. Do you like Network Master - Speed Test?